Today we attempted to take a look at the cryptid, the yowie! But the conversation takes an odd turn. Joined by friends, Abysmii, Papreeka, and CF Comer, we step into the shimmer and talk about the movie, Annihilation. If you like our show, you can help support us by subscribing on whatever platform you're listening on. Joined by our friends, Abysmii and Papreeka, we discuss the Cloverfield franchise and what we think went wrong. Today we discuss Devilman: Crybaby with some comparisons to the OVA and original manga. A short and sweet episode with Seid sharing some personal tips and advice on productive planning for projects and everyday life. Character Design Forge - What Are Your Goals? Dead Palette and CF Comer resume their discussion of the Silent Hill movies with Silent Hill: Revelations. Dead Palette and guest, CF Comer, take over to review and discuss the Silent Movie released back in 2006. To start off the yeah, here is an episode we meant to release back in December. We talk to the talented artist and animator, Versiris, about some of the challenges she faced in becoming a working creative. If you like our show, you can help support us by subscribing on whatever platform you're listening on and leaving a review on iTunes. The end of the year draws closer, but there's still plenty of time left for horrible things to happen. 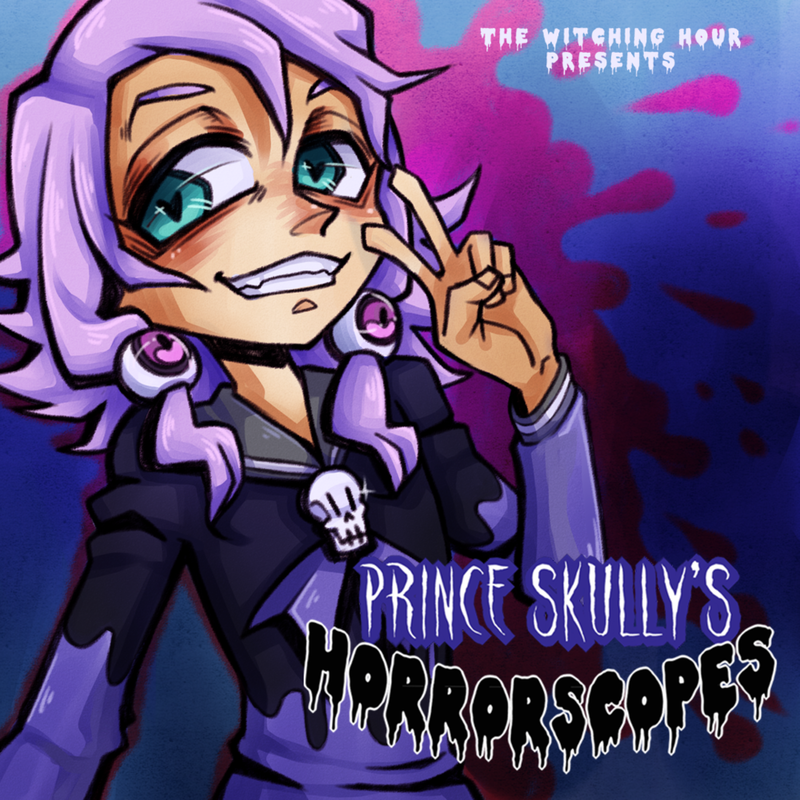 Monthly "horror"-scopes from Prince Skully. Written by Jesse Reyes & Zathoth. As a Halloween treat, here's a look at some of the fun we had with our friends at Midsummer Scream 2017. With yet another movie on the horizon, we discuss the Texas Chainsaw Massacre franchise. Joined by Allen Chaney, we share our own thoughts on what made the original film iconic to the horror genre, what's become of the franchise today, and our expectations for the new film. Joined by guest, Heather Donnelly, we discuss the way mental illness is often depicted in narratives from the horror genre and the stigmas it's created. It’s finally that wonderful time of year when the moon shines brighter, shadows loom a bit darker and spirits begin to wander. What will have fate have for you, my darlings, a treat or a trick? Today, we begin an ongoing discussion about the 2014 Cartoon Network miniseries by Patrick McHale, Over The Garden Wall. Joined by guest CF Comer. If you like our show, you can help support us by subscribing on whatever platform your listening on and leaving a review on iTunes please! Dead Palette and Allen Chaney take over The Witching Hour to review the newly released It movie. Today we're joined by guest, Alex Hatzberger, and friend, David King, for an informative discussion about RPGs and its interactive story telling. Time stops for no one! Will you keep up or fall into the void? Part 2 of our Midsummer Scream coverage! Joined by our friends, David King, Kaela Berry, Allen Chaney, and a new friend to the show, Prasakour. Joined by our friends from Raygun Readers and artist CF Comer, we talk about our experiences at this year's Midsummer Scream Halloween Festival and our hopes for next year!